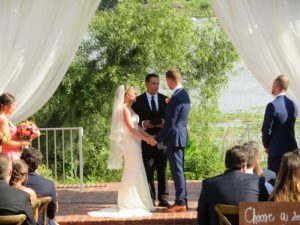 Olivia and Christopher chose the beautiful Cypress Grove Estate House, in Orlando, Florida for to exchange their vows. It had been raining the entire previous week, so everyone had their fingers crossed for nice weather. And they were not disappointed. It was sunny and gorgeous as the couple exchanged their vows in front of Lon Tosi from Sensational Ceremonies. Plan It Events did an outstanding job in keeping everything flowing well. Flowers by Lesley provided the flowers for the wedding. They were beautiful! The cake came from Jillycakes in Winter Park. Their guests rocked the night away to the tunes of Our DJ Rocks. The event was captured by Emma Shrouds Photography and The Garrs Video. RW Rentals and Rentaland Tents provided the chairs, tables and tent for the event. There was even a photobooth, provided by Photobooth Rocks to capture the entire audience of 130 people in their funniest poses! Overall, it was an amazing evening made for memories! Good luck Olivia and Christopher! You are off to a great start! The couple was to continue to celebrate their new marriage with a fantastic honeymoon in Hawaii!